Sculptural works of art that depict a creation from an artist’s imagination, sometimes with a pop culture basis, that also evokes nostalgia by fitting the form if not also the function of a child’s toy. That single sentence, for all intents and purposes, briefly but adequately explains what designer toys are. But when pondering where they came from, most scholars of the field would likely cite Bounty Hunter‘s vinyl produced rendition of Shinichiro “Skate-Thing” Nakamura‘s Kid Hunter (1997) as the art movement’s origin point. Though what if they were wrong? Yes, others have debatably associated the likes of Jeff Koons and Andy Warhol to the lineage of designer toys, but what if there was an unqualified antecedent of the form that predates even these? 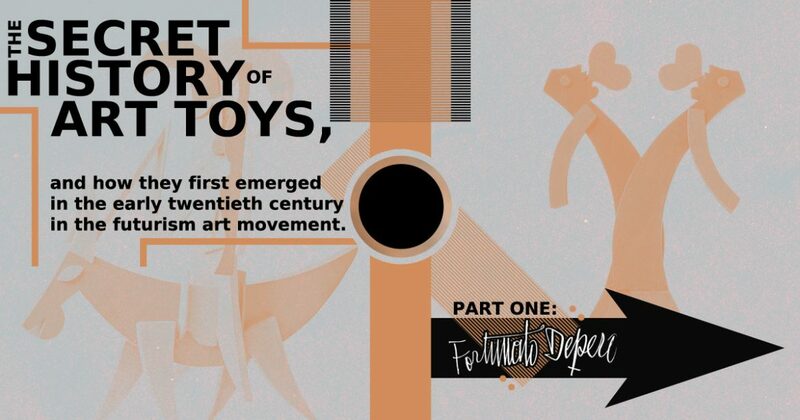 And thus we find ourselves looking back to the early 20th-century, specifically when Italian artist Fortunato Depero made a declaration calling for “Futurist Toys” to be embraced into the Futurism art movement. Marked by a hatred for anything representative of the past, viewing bygone era influences as aristocratic and ancient, the Futurists had a strong desire to rebuild art and society anew. Arguably ahead of its time, Futurism found inspiration in machine-driven technology, sought to treat “highbrow” and “lowbrow” arts equally, and championed several mediums that would prove important in the following decades, including graphic design. And, perhaps most importantly, Futurism was an art movement that embraced mass communication and advertising. While people recognized Futurist works through their tendency to employ geometric shapes, the illusion of movement, and large areas of flat, bright color, they knew this aesthetic due to a genuinely new information technique employed by the artists: the manifesto. In fact, the movement itself was initiated by poet Filippo Tommaso Marinetti when he issued a manifesto, like a declaration of war, on the front page of February 20th, 1909’s Le Figaro newspaper. And not only would this literary direction spawn subsequent manifestos, it would also result in a dedicated magazine to the movement, Lacerba, an issue of which found its way to the village of Fondo in Italy only to be discovered by a marble worker’s apprentice. Inspired by what he read, this man — Fortunato Depero — moved to Rome after his mother’s death in 1914 and sought to become part of this revolutionary Futurism movement, issuing his own manifesto the following year. On March 11th, 1915, the 22-year-old Depero and his mentor, painter Giacomo Balla, issued their seminal “Futurist Reconstruction of the Universe” manifesto. Calling for a re-envisioning of every aspect in the increasingly oppressive world, they advocated for opera d’arte totale (trans. “total work of art”), an ensemble of works that would surround the viewer completely in a Futurist environment. And while Balla, Depero, and other Futurists acted on this idea, each opening their own case d’arte (trans. “art house”) to market their decorative art designs, the majority of the manifesto concerned itself with a new form of sculpture, one they referred to as plastic complexes. While meant to be autonomous, or resembling itself alone, these fantastic and imaginative “new Object” works were simultaneously meant to evoke nostalgia through their “anguished re-evocation of a lost Object”, the sort that traditionalists venerated. And one manifestation of these plastic complex pieces detailed was “The Futurist Toy”, or toy-like forms that weren’t the imitation of reality that were commonplace but rather artistically designed works appropriate for both children and adults alike. And, in essence, this is exactly what designer toys are. But Depero didn’t simply conceive the idea, he created practical examples. While Depero’s paintings and drawings were more imitative than innovative, his graphic aesthetic translated perfectly into advertising, architecture, furniture, posters, tapestries, theatre sets and costumes, typography, and toys. Embodying the Futurist ideals in his toy works, Depero’s pieces tend to shy away from static stances and instead capture mid-movement appearances. And this simulated movement is accentuated by the painting scheme, contrasting colors exaggerating the limbs, such as that seen in the lumbering gait of his Series di n. 8 rinoceronti (Series of 8 Rhinoceros). Mainly crafted out of wood and produced between 1917 and 1930, Depero’s “Futurist Toy” creations can be primarily found filling his House of Futurist Art in the Italian town of Roverto, whom the artist bequeathed roughly 3,000 works to upon his death on November 29th, 1960.